(Newser) – Home aquariums used to pretty much be for fish only. That changed with the advent of LED lights, which allow hobbyists to replicate a tropical sun indoors—without boiling the water in the tank. And so a new industry boomed: A subset of aquarium hobbyists—often called "reefers"—have for the last couple of decades been busy building actual coral reefs in their own homes. But as beautiful as these brilliantly colored tanks can be, they do have a dark side, and the Washington Post peeks into the shadows. It looks at the case of a family of seven in Australia who woke up from their sleep one May night this year to find they were having trouble breathing. The root of their issue: the zoanthid coral in their tank. One family has an issue and the entire hobby 'has a dark side'? 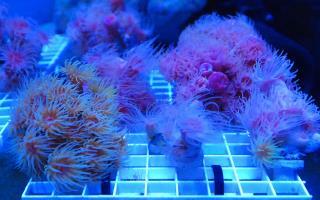 People have been reefing for decades before LEDs. LEDs keep the heat down but reef tanks are not new at all.